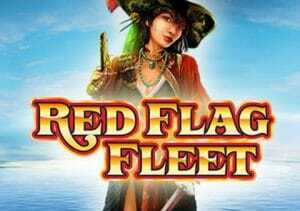 Pirates and China are 2 of the most popular slot genres and developer WMS has combined them to create Red Flag Fleet. Based on the notorious 19th century female buccaneer Chang Pao, this seafaring adventure comes with a bonus feature that awards up to 80 free spins with 2 or 3 reels wild on each free spin. Take to the South China Sea from between 40p and £120 per spin. Red Flag Fleet is played on an unusual game engine – the 2x3x4x5x6x7 row set up delivers 192 ways to win with winning combinations formed when the same symbol lands on successive reels. Those symbols include lower value playing cards as well as 5 pirates. The top paying crew member is Chang Pao who awards 10 times your total stake if you land 6 in a row. The Red Flag Fleet logo is the wild, replacing all other symbols apart from the scatter. It pays up to 12.5 times your stake. All of these symbols can appear as stacked, boosting your chances of creating a decent winning combination. The Chinese junk ship symbol triggers the Free Spin Bonus feature which is played out on a new machine that has 7 rows on reel 1 and 2 rows on reel 7. 3 ships will get you 5 free spins. 4 will get you a payout of 10 times your stake as well as 12 free spins. If 5 ships sail into view, your reward will be a 50 times your stake payout plus 40 free spins. On each free spin, 2 or 3 reels will turn wild. You can re-trigger more free spins here too if the scatters land favorably giving you potentially 80 free spins in total. Visually, Red Flag Fleet is nicely done – set against a watery backdrop, the stacked reels work rather well, complemented by the sounds of the ship and Chinese style backing track. It all comes together nicely. The variance here is in the medium to high range with the likeliest way to secure a decent haul of treasure coming from the free spins feature where the added wild reels can have a big impact. With maximum payouts of 2,400 times your stake on offer on each spin, that’s some serious loot. Get lucky with those wild reels and these pirates can pillage plenty of gold. I also recommend WMS’ Zeus III which is identical in terms of gameplay.